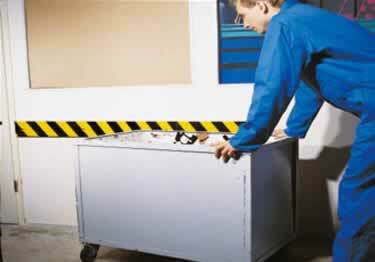 Reduce impact damage to walls, equipment and machinery while reducing personal injury risks with Bumper Wall Guards. These foamy, cushioning guards are made from flexible, recyclable polyurethane foam that absorbs the force of impact and gently bounces back. Available in five types and a variety of colors, including a reflective version that is highly visible when headlight beams shine on it, and photoluminescent versions that provide long-lasting luminance for increased visibility in sudden darkness. Most guards are self-adhesive. Type H+ and S1 come with a steel support and anchors option. Reflective Silver/Red- this color is very bright and visible when vehicle headlights or flashlight beams shine on it. White - White foam and white bumper allow is safety bumper guard to blend into environments like hospitals, doctor''s offices, laboratories. Most Types come with a strong acrylic self-adhesive bond (21 N per inch). Type H+ and S1 come with a steel support and anchors mounting option. Reduce impact damage to walls, equipment and machinery while reducing personal injury risks with Bumper Wall Guards. These foamy, cushioning guards are made from flexible, recyclable polyurethane foam that absorbs the force of impact and gently bounces back.